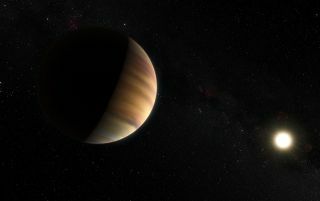 Artist’s illustration showing the giant, Jupiter-like exoplanet 51 Pegasi b, which in 1995 became the first alien world to be found around a sunlike star. More than half of the giant alien planet candidates detected by NASA's prolific Kepler space telescope are false positives, a new study suggests. A team of astronomers followed up on 129 huge potential exoplanets spotted by Kepler using a ground-based telescope and found that 52 percent of the objects are actually stars, while another 2 percent are strange "failed stars" known as brown dwarfs. "Our extensive spectroscopic survey, of the largest exoplanets discovered by Kepler, shows that this percentage is much higher, even above 50 percent," Santerne added. "This has strong implications in our understanding of the exoplanet population in the Kepler field." The $600 million planet-hunting Kepler mission launched in March 2009, with the aim of determining how common Earth-like planets are across the Milky Way galaxy. The spacecraft spots alien planets by noticing the tiny brightness dips caused when worlds cross their parent stars' faces, or "transit," from Kepler's perspective. Kepler originally stared at more than 150,000 stars simultaneously, hunting for transits. But in May 2013, the second of the spacecraft's four orientation-maintaining reaction wheels failed, robbing Kepler of its superprecise pointing ability. Kepler is now embarked on a new mission called K2, during which it hunts for alien planets on a more limited basis and also observes other objects and phenomena, such as supernova explosions. Kepler has been an incredibly successful planet hunter. To date, the observatory has discovered 1,030 bona fide alien worlds (more than half of all the confirmed exoplanets ever found), as well as another 3,660 "candidates" that await vetting by further observation or analysis. Santerne and his colleagues performed such follow-up work with 129 Kepler candidate worlds thought to be about the size of Jupiter or bigger using the SOPHIE spectrograph, an instrument installed on the 6.3-foot-wide (1.93 meters) telescope at the Observatory of Haute-Provence in France. SOPHIE's measurements showed that more than half of the big planet candidates are actually stars — specifically, "eclipsing binaries" that cross the face of their stellar companions in two-star systems. An additional 2 percent are brown dwarfs, mysterious bodies that are bigger than planets but too small to ignite the nuclear fusion reactions that power stars. Kepler team members said they're not surprised by the new results, which have been accepted for publication in the journal Astronomy & Astrophysics. The Kepler team already knew that many of the big exoplanet candidates would eventually turn out to be false positives, said mission research scientist Jeff Coughlin, of the SETI (Search for Extraterrestrial Intelligence) Institute in Mountain View, California. "When we do our vetting, we apply the principal of 'innocent until proven guilty,'" Coughlin told Space.com. "We don't declare something a false positive based on its inferred size alone." The diameters of Kepler planets and planet candidates are worked out from the sizes of their parent stars, based on how much light these worlds block when they transit. But many of the stars' sizes aren't known very precisely, so the Kepler team doesn't want to throw out any candidates that future stellar observations could conceivably bring back into play, Coughlin explained. Still, Kepler researchers fully expected that additional observations, like the work led by Santerne, would indeed rule out many of the bigger candidates, he said. Coughlin praised the Santerne et al. study as "really nice work," but he stressed that the implication that half of all Kepler candidates are actually false positives is misleading. The new study applies only to giant planet candidates; the false-positive rate drops significantly with smaller worlds, such as those the size of Earth, Coughlin said. "It's much easier to have an eclipsing binary mimic a very large planet," he said. "It's hard to get it to mimic a very small planet." And Kepler has found that small planets are much more common than gas giants throughout the Milky Way, so the mission's overall false-positive rate should be quite low, Coughlin added. "I think at least 80 percent is a good number," he said, referring to the percentage of Kepler candidates that should eventually be confirmed. The Santerne et al. study does not apply to the 1,030 confirmed Kepler worlds, which have already survived the follow-up vetting process.